Every summer I look forward to more time for exercise and usually that means a daily walk with something playing in my ear. Last week, it was Simon Sinek’s Ted Talk on how great leaders inspire action. This talk is not specifically about education but as usual, as I was listening , my brain started thinking about school. In his talk, Sinek explains what he believes make organizations and leadership successful. He says that the great leaders and organizations in the world are motivated, by what he calls, the golden circle or the why, how and what. And as he explained this theory, I was already applying it to what I have learned about teaching. In our job, we all know what we are supposed to do -educate students. And we are usually given the how – curriculum, supplies, professional development. But Sinek would argue that for most, it’s the why that is unclear. He says that very few people and organizations in the world know why they do what they do. What’s your purpose, your cause or belief, he asks. Why do any of us get up in the morning? Why do we teach? I know why. And it’s more than just wanting to make sure my students are academically proficient. I want my 1st grade students to know how to learn, to ask questions, to collaborate with each other, to be able to solve problems and to push themselves to learn more. I want them be concerned, confident and compassionate citizens of the world. In my classroom, students are learning to read, write, and work with numbers. They are doing projects and using technology to connect, capture and create new learning. But I know now that it’s the work we do around these pillars that drive my instruction and their learning. There is so much pressure around test scores and academics and yet very few administrators seem to care how we are teaching students these 21st century skills. I have learned that it’s these skills that push my students to think critically and learn more. It’s our daily classroom meetings that build community and help us work together to solve problems. It’s a mindset for learning that is explicitly taught. We start the year by learning step by step what it means to be a self directed learner. Then we do the same to define what it means to be a critical thinker. And every day of the year we practice persistence, optimism, empathy, and resilience. This is why my students and my fellow teachers at Queen Anne Elementary are successful. It’s why I love my job, and why I look forward to getting to school each morning. I would love to hear your why. And of course, here’s the link to Simon Sinek’s Ted Talk. 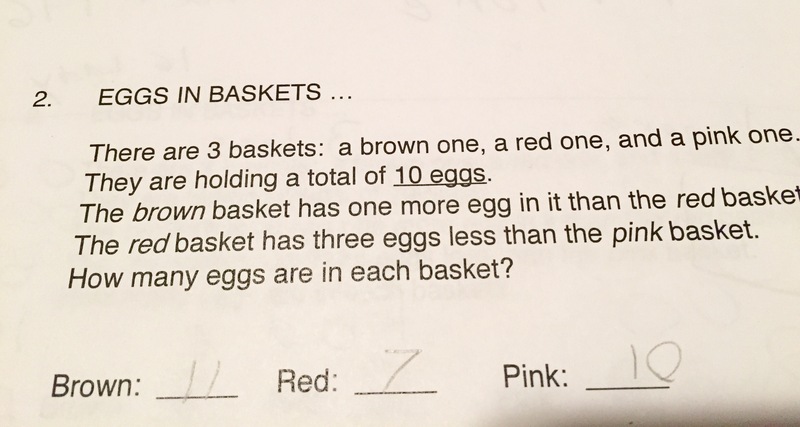 I’m just going to say it , straight out, Math is hard to teach, even in first grade. Students seem to love it or hate it – not many fall in between. You have those kids who struggle and you have those kids who seem to know everything. 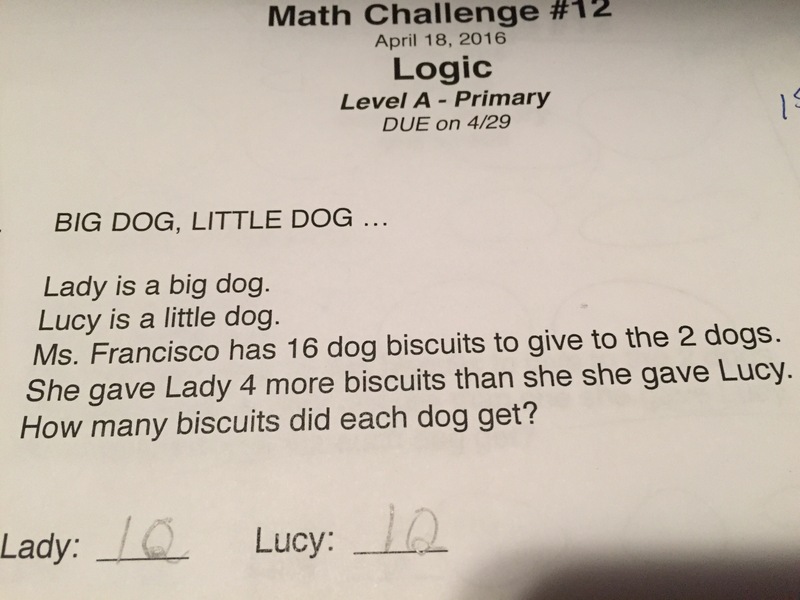 This school year, our schools math specialist started a bi- weekly math challenge. Just the word challenge seemed to motivate my students and so we did it, regularly, every 2 weeks. My students did well, (getting the answers) but what I did better as a teacher was to ask ask more questions. How do you know that’s the right answer? Could there be a different answer? Show me your thinking! So by the time we got to Math Challenge 12 , I was really on auto pilot. It was the first Monday after spring break and I have to say I grabbed the math challenge and thought “perfect, an already planned lesson. Let’s go! 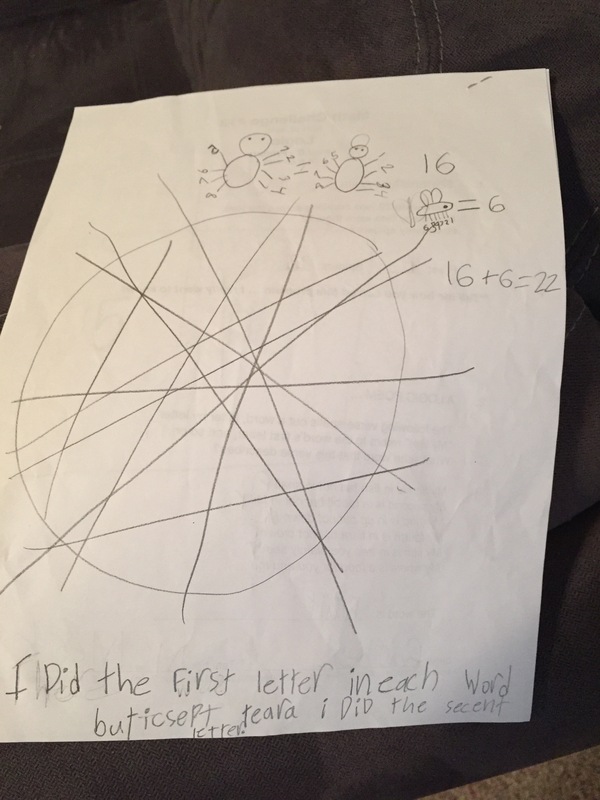 ” I put the problem on the overhead, read it, heard my students say “this will be an easy one” and they grabbed their pencils and went to work. And then, as usual, I watched my “high” math students finish quickly and one by one the rest finished too. We moved on with our day. It wasn’t until that afternoon that I went over their work. And while shocked may be a bit of an overstatement – it really was close to what I was feeling when I realized that all of my students but two, got the problem wrong. Hmm. What did I do wrong? 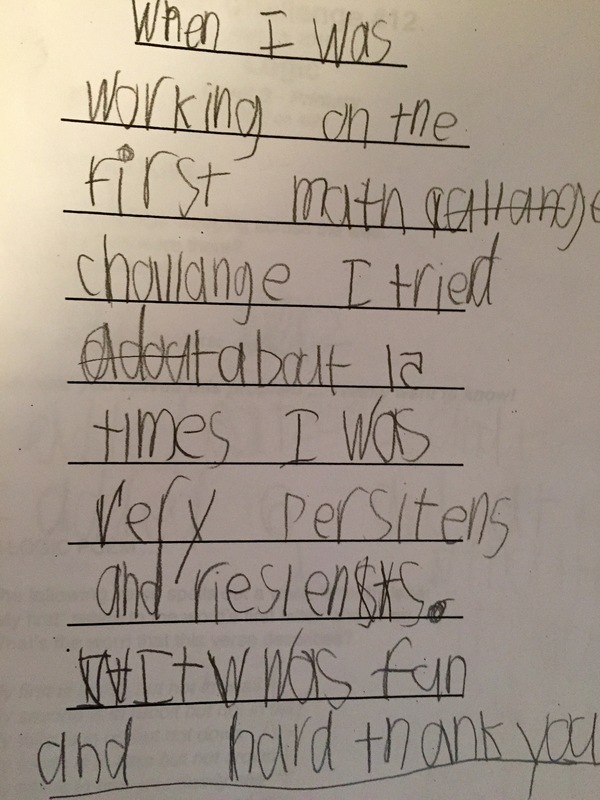 In my classroom we have spent the year talking about doing our best, persisting through hard tasks and rising to a challenge. The book, A Mindset for Learning by Kristine Mraz and Christine Hertz has helped my students learn that growing our brains is going to make us more successful in life. So the next day – this was the morning message that greeted my students. But first we would practice a new brain grower- Resilience, “When you have trouble, you bounce back and try again.” During this conversation, my students admitted that the challenge was hard and they too were tired after spring break. They promised to start again and when they finished , they would grab the 2nd challenge as well ( There is always 2 challenges – Level A and Level B) . And of course, they would show their thinking. This time they grabbed their pencils, math manipulatives and went to work. And one hour later, students were still working. And by working I mean real work. The answers didn’t come easy and no one was copying anyone else’s work. Soon the students who were struggling the most were working in groups and I got out my phone to ask a few how they were feeling. Today, I’m looking over their work once again before sending it on to our Math Specialist. She will pick a “winner” for our primary and our 3,4,5 students. 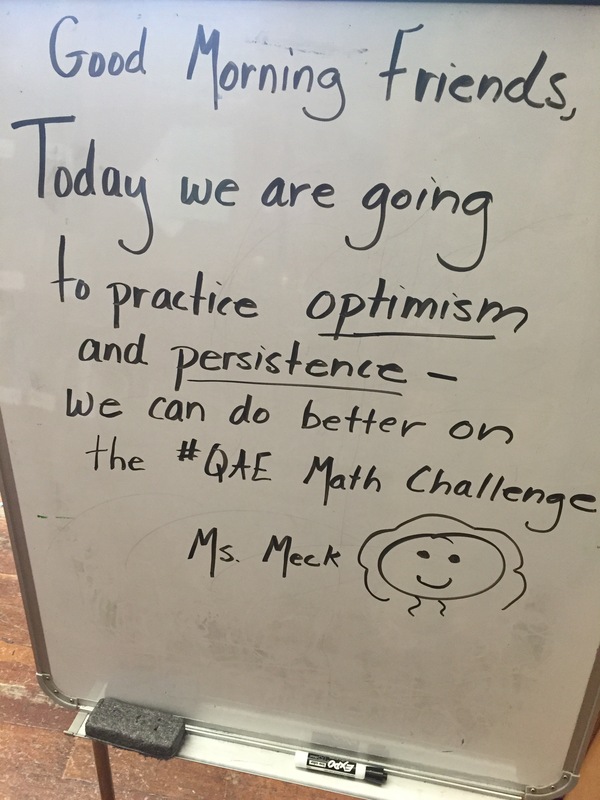 I believe we proved that we are persistent and resilient in @MsMecksClass even if all that math thinking comes with a price. It’s a typical afternoon in my classroom. We’ve just finished our last recess and students are coming in excitedly. As part of our routine, students begin to seat themselves around the outside of the rug, during this time they are chatty and high energy–a normal first grade class. We all get seated and the breathing leader tells students that today we will do 10 deep breathes. He rings the bell and then slowly begins to lead students in 10 deep breathes. At the end of the breathing, all students are quiet and have placed their hands palms up on their knees, ready to begin our compliment circle. As a stuffed puffin (our class talking stick) begins to make it’s way around the class, students compliment each other for a variety of things that happened throughout the day. One student thanks a classmate for walking her to the office when she skinned her knee. Another student thanks a friend for including everyone in soccer and playing fairly at recess. After receiving a compliment, students fold their hands together as a silent signal they no longer need a compliment. Our compliment circle finishes in about five minutes and then we move onto our class meeting agenda for the day. We have one problem to solve as a class today–lately our transitions have been noisy and taking a lot longer than normal. We bring the transition problem to the class and brainstorm possible solutions. During our brainstorm time, students bring up various solutions and raise concerns that may accompany the solution. As a class students vote and hone in on the idea of timing our transitions on one of the iPads. One student raises the concern that students might get too wild in the rush to beat the timer so we also develop a guideline of “When we transition, we will transition quickly, quietly and safely”. The solution is put into place that afternoon during pack up. We will continue to try this solution for a week or so before revisiting at a class meeting to see how it is working. When I came to Queen Anne Elementary, I had never had formal Positive Disciple in the Classroom training and was only vaguely familiar with it. 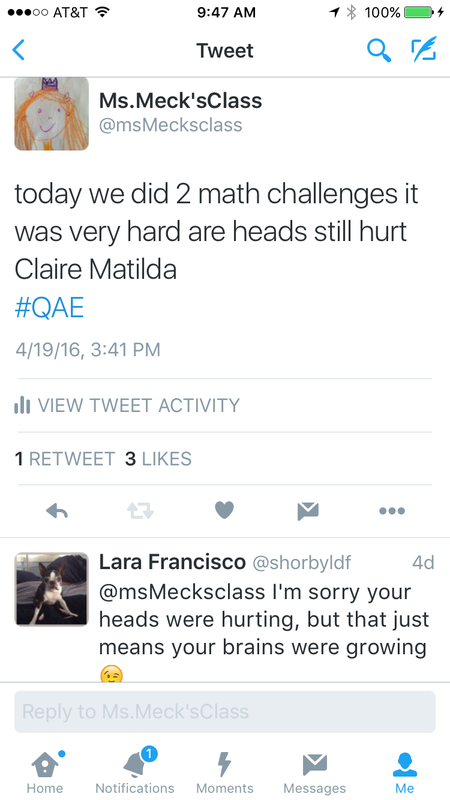 My first year at Queen Anne, I was able to take a training very early in the school year. 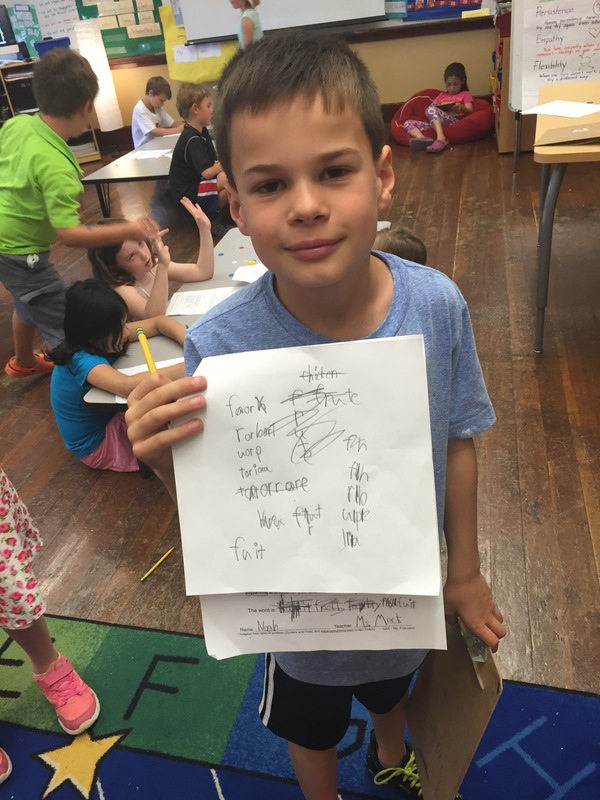 At first, I struggled with implementation in my classroom. I have never been a teacher who yelled or was punitive to students but turning classroom problems over to students to solve was challenging. I was used to fixing class problems quickly and making the rules for the class. I was a kind dictator in my own classroom. Giving students ownership in daily classroom decisions means that I am not the only one making the class rules. It also means that sometimes a student driven solution is complicated and does not solve the problem. In this case, we revisit the proposed solution and adapt as needed. What I observed and began to realize about the power of class meetings was that each of my students realized they had a voice in the decision making process, and not only could they come up with solutions but they could help solve problems for the class as a whole. Our class meetings follow the same format every time. Using the same format means students know what to expect and this leads to an efficiency in our class meetings. We begin with deep breathing to calm down and get ready to focus. Our class meetings take place at the end of the day after the last recess, not a time first graders are normally very focused. We do deep breathing to regain focus and this sets the calm tone for our meeting. We then open with a compliment circle. We focus on giving “inside” compliments vs. “outside” compliments. 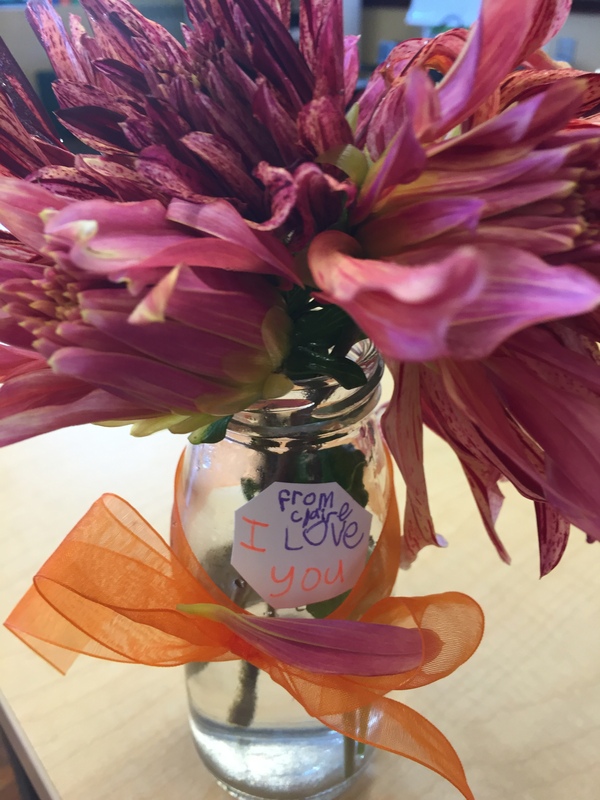 Inside compliments are compliments that are focused on actions, behavior and character traits. After our compliment circle, we move onto class problems that need to be solved. Sometimes there aren’t any problems, in that case we close with a fun game or high five and move on with our afternoon. If there is a problem, we brainstorm possible solutions and then vote on these solutions. Most of the time I am merely the scribe during this time, however, if a student comes up with a solution that is punitive or not practical, I step in and say “As a member of the classroom, I can’t live with that solution” and we strike the possible solution. This does not happen regularly. After students are done brainstorming, they vote. As a wrap up to the class meeting with end with a fun game or high five. We do class meetings 3-5 times weekly and they usually last 10-15 minutes. By implementing class meetings, my classroom now runs more smoothly, there are less behavior problems and all students feel like important members of the classroom community. It’s been a hard week. 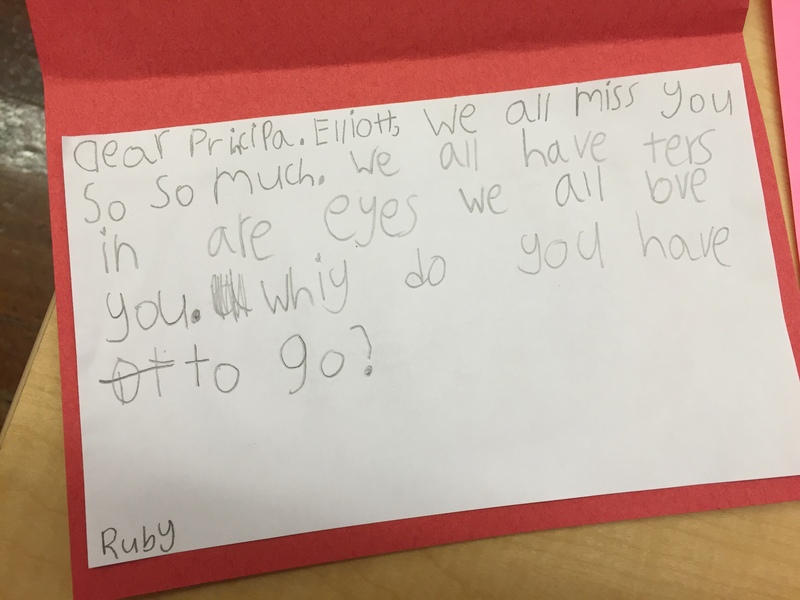 Our school community learned that our principal and the founder of our school was leaving. On Wednesday afternoon, district leaders told our staff that our principal, David Elliott had decided to take a leave and would not be returning this year or next year. He was gone. For Good. Period. Obviously, our district had sent our parents a letter the night before and it was clear that most of them were in shock too. It seemed that very few in our community believed that our leader, the man who built our school would leave without a word. And since I had already been touched by one child’s act of kindness, I wanted to make sure our community knew that these were the students we were growing. 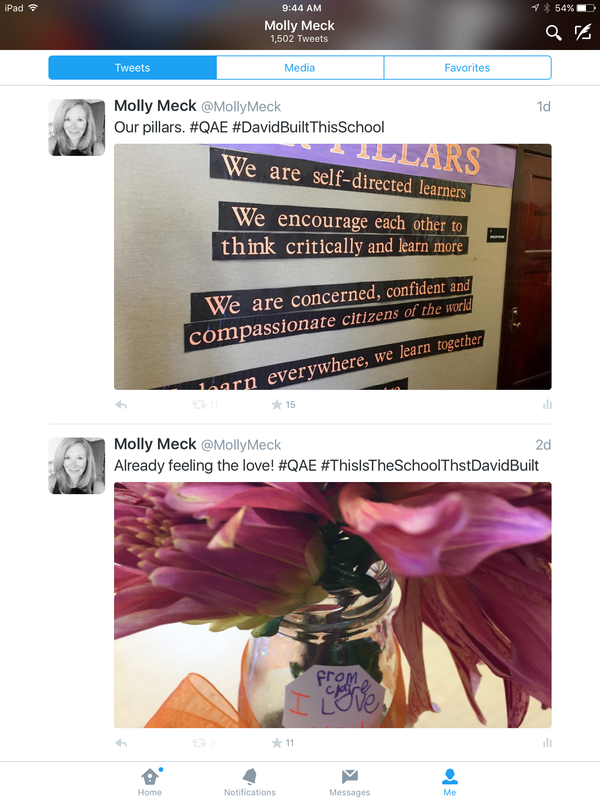 So I sent out a tweet with the hashtag #ThisIsTheSchoolThatDavidBuilt and despite the typo, people saw it and responded. Soon our families were connecting in person and on social media. I now had less than 10 minutes before the first bell and my head was spinning with questions, “What would I tell my students? Would they be feeling the same sadness? Would they also be wondering if our school was going to change? Who would be in the lunchroom and who would be leading our school?” And then I did what I do on many days when I’m unsure of my next steps. I walked down the hall to look at our pillars that greet every visitor that comes to our school. These pillars are the foundational statements that guide our teaching and learning.I snapped a picture and sent this tweet out to the world tweaking my hashtag so that it read #DavidBuiltThisSchool. And when things get hard at our school, students and teachers, come back to these pillars and know that they can and do hold us up. 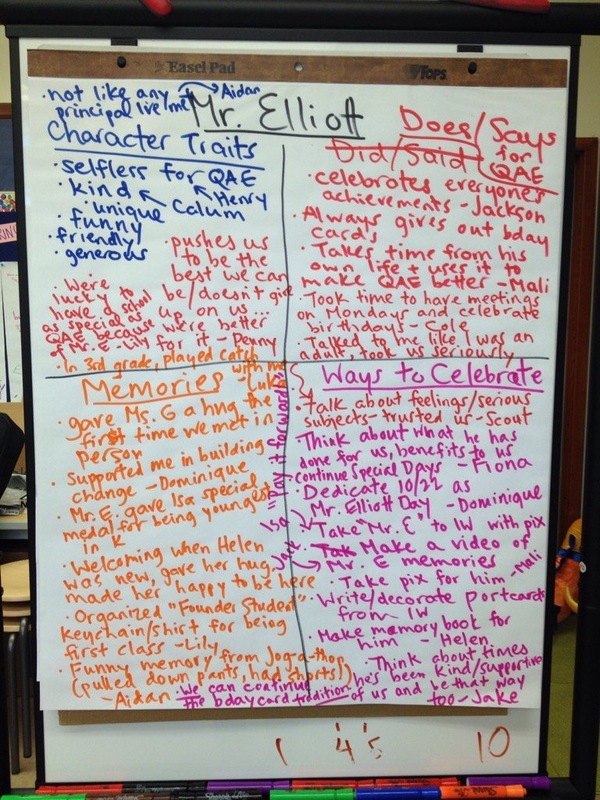 All of us held classroom meetings so that students could talk and ask questions about Mr. Elliott’s sudden departure. In first grade, I think both Alicia and I would say that our kids really helped us remain strong. And in fifth grade, the students who came here when Queen Anne Elementary was brand new worked through their feelings together. There were lots of tears and many memories shared. Life Lessons. And while we were inside the building, our community was outside working to make sure that the school that David built was going to move forward. I know it will. The work here is to important. Of course, there is much more to this story. And the end hasn’t been written yet. Our principal isn’t perfect. In a letter to our community he admitted that he did make a mistake by not completing teacher evaluations last year. But we are standing with him anyway because he is more than his mistakes. So thanks to all of you who are fighting the fight to get our principal back. It’s my belief his work is not finished. And thanks to all of you who are fighting in schools everywhere for the chance to teach kids more than just academics, It is the life lessons, good and bad, that matter most. Three years ago, my kindergarten team and I started launching our school year with a project called Who Am I ? There are three speaking, listening and viewing student goals for this project. The first goal is ‘to look at and acknowledge the speaker’. The second goal, ‘speak audibly and express thoughts, ideas and feelings clearly’ and the third goal, ‘describe familiar people, places, things and events and, with prompting and support, provide additional detail. These goals’ are directly aligned with the national kindergarten CCSS for literacy. It is critical in kindergarten to set up a supportive learning environment in which students feel comfortable speaking and are respectful listeners, so starting the year with this project makes so much sense to us. From the first day of school, we focus on helping our students use their bodies, voices and brains to listen as they learn the routines of kindergarten. 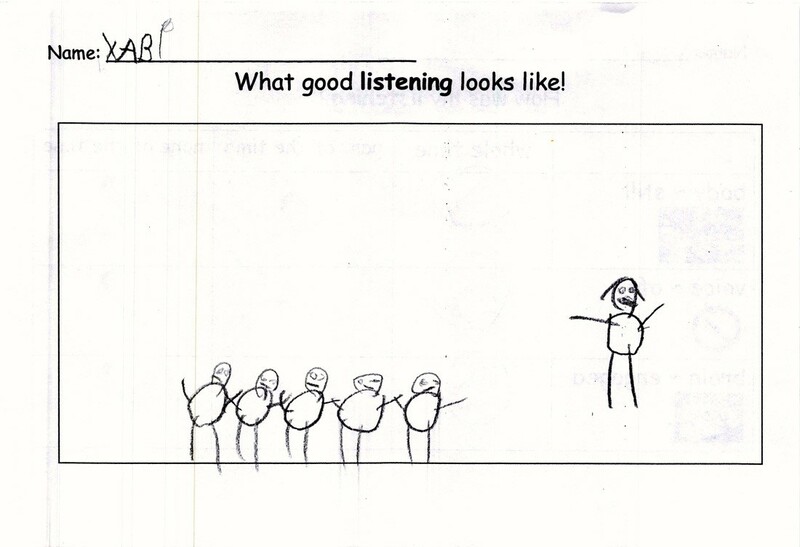 We talk about how good listeners use a still body, a voice that is off and an engaged brain to listen. We post a Listening anchor chart as a visible reminder . 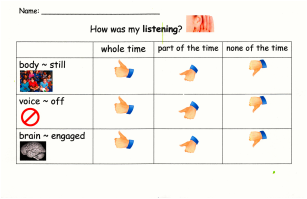 Each day, we assess our listening using a thumb signal. 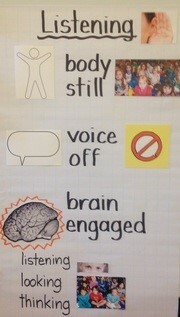 This helps our students internalize what their brains, bodies and voices need to be doing when they are listening. We use our listening to learn how we are the same and different and to explore who we are in our community. We practice our listening constantly and consistently during mini-lessons, class meetings, peer sharing sessions and weekly school assemblies. During these first few weeks, we observe and assess these important skills. We use checklists to track the level of proficiency and comfort our students have when communicating with each other and identify students who need extra help and provide them with additional support. 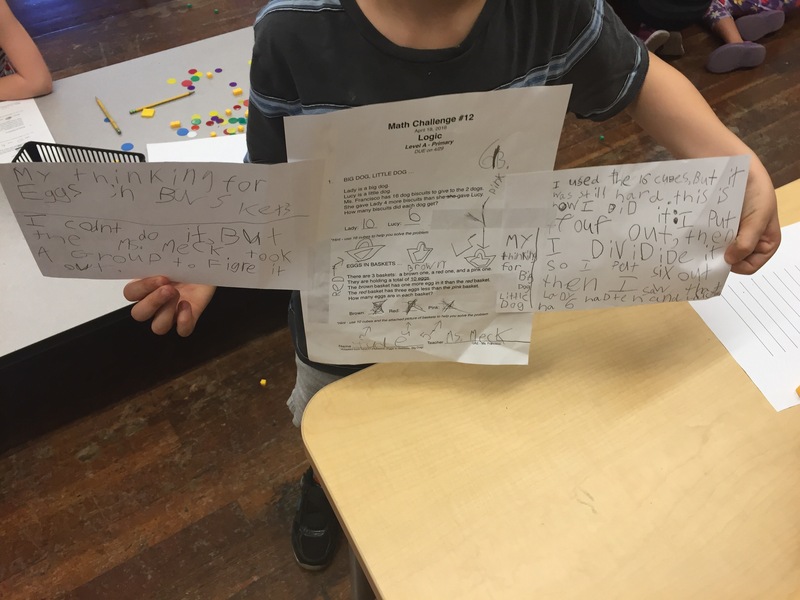 In early October, we transfer our thumb system to a paper student self-assessment rubric. We use these self-assessment rubrics throughout the year to help students self-assess their learning and set goals for future learning. After our classroom positive discipline routines are in place and our collective listening is solid (usually early October) we officially launch our project. We read the book Whoever You Are, by Mem Fox and start thinking about the question ~ What Makes Me Me?. At a station, students reflect on this question, creating drawings that communicate to their classmates information about who they are and how they fit in their community. 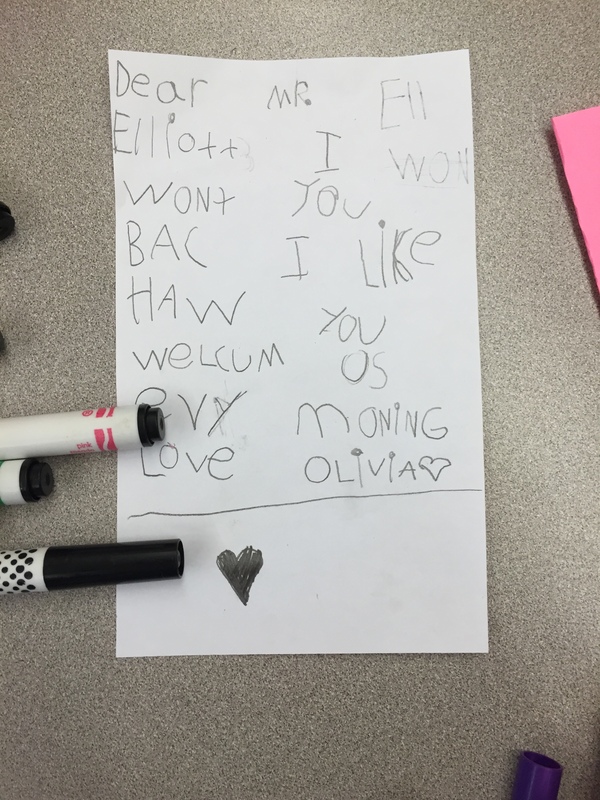 We continue to read great books and share our thinking on our classroom blog via drawings and blog posts that reflect on the questions: What do I love to do?, and What do I want to learn how to do that I don’t know how to do yet? At this point in the project, we start to deepen our self-exploration by asking ourselves ~ How am I the same? and How am I different? than my new kindergarten friends. As we identify the similarities and differences between us and discuss how these differences are what make us each so unique and wonderful. 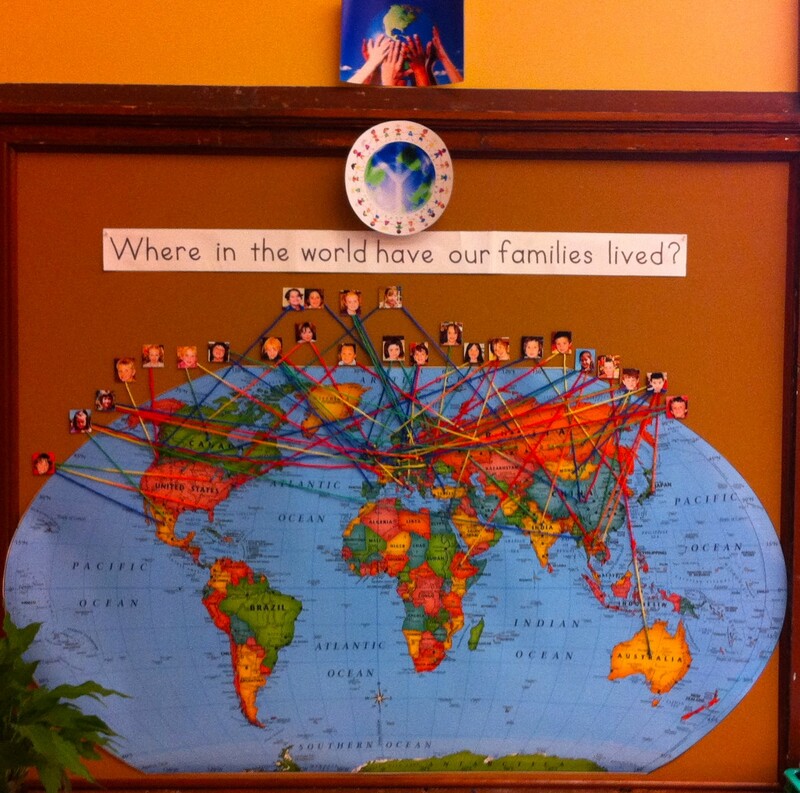 We talk about our families and create a Where in the World have our Families Lived? map learning about our families’ history and backgrounds and providing more ways to think about how our families are the same and different. We then summarize our listening learning and transition to speaking instruction with a Museum of Us gallery walk activity. (See http://cryanleary2014.weebly.com/class-blog/launching-our-1st-project-based-learning-pbl-project-who-am-i) Each student brings an object from home that represents who they are. During the gallery walk activity, students have a turn to be both a speaker and a listener. When they are a speaker, they have a safe opportunity to present their object to classmates one at a time, using their speaking to teach others who they are. When they are a listener, they use their listening skills to learn new things about their classmates.After the gallery walk, speakers give compliments to classmates that they noticed being really good listeners while they were speaking. Listeners were complimented for standing still, for not touching the speakers object, and for focusing on the speaker. After the students have had a chance to participate in the gallery walk as a speaker and listener and assess how they did, we give our first speaking lesson, teaching our students that effective speakers use their bodies, voices and brains to speak, the same three things we use to be good listeners. 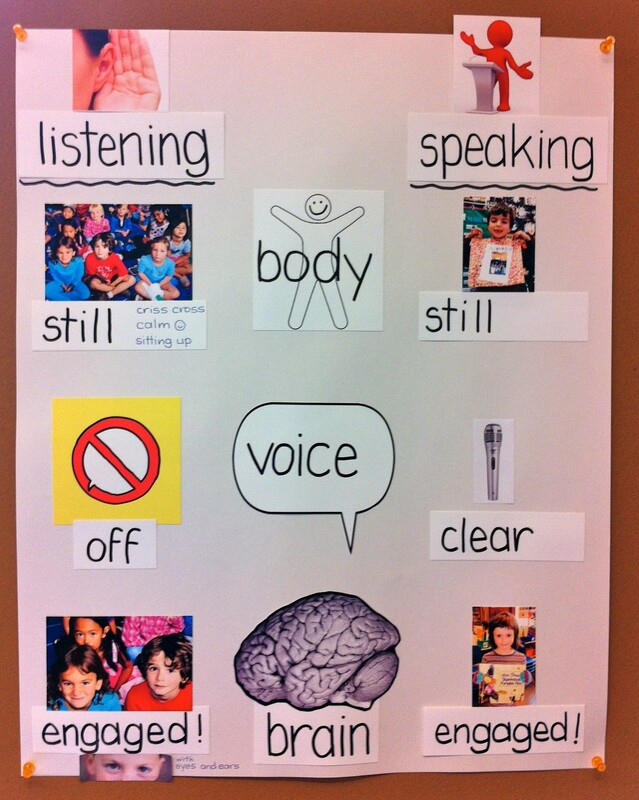 We add speaking to our existing listening poster, helping the students make this connection. For the next week, we dive into noticing speaking. We talk about what good speaking looks like and watch videos of kids speaking, some effective and some not. We talk about what a still body looks like, we practice using clear voices, and talk about how we know speakers brains are engaged – the speaker looks at the audience, their fluency and pace of speech allows the audience to understand. We look around us for examples of all of these things and point them out when we notice them. While we are exploring speaking in class, the students work in art class with our art teacher to create pieces showing who they are and how they are the same and different from other members of our classroom community. These art pieces include a self-portrait, a plate showing favorite foods, a shape collage showing the student’s home, a thumbprint family portrait and a drawing of the student’s favorite activity. 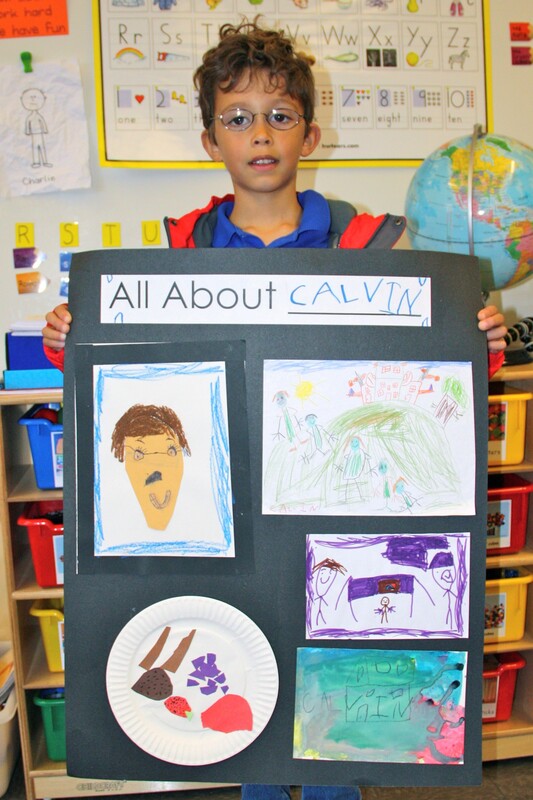 These art pieces are used to create an All About Me presentation board. Before the final posters are created, students are given station time to use the cameras on their iPads to record each other speaking about their favorite activity, practicing their speaking for their final presentation. Then, after the posters are pasted together, students do a final practice, this time presenting to their small table group at a station. Before this practice, we review our effective speaking criteria: to have a still body, a clear voice and an engaged mind. After each student presents, the audience provides feedback about what they observed the speaker’s body, voice and brain doing during the presentation. The speakers also gives the audience feedback about their listening. After this small-group practice, students view their video, assess their speaking using the student self-assessment rubric and then set a goal for how they plan to improve their speaking for their final presentation. They also listen to and view the presentations of their peers. This provides each student an opportunity to showcase his/her speaking skills as well as multiple opportunities to demonstrate their listening and viewing skills as a member of the audience. After presenting, students view a video of their presentation and self-assess their speaking skills on a final speaking rubric. Final presentations are videotaped and uploaded to student e-folios, along with students’ final self-assessments. Each year, I expect students to be hesitant to do their final presentations. Each year, I am surprised that almost every student volunteers to go first. For the three years we have done this project, all of my students have successfully used effective speaking skills to share their poster with the class. I am amazed at the excitement and confidence my kindergartners bring to this activity ~ every one of them bravely speaking. They also work hard as audience members for their classmates’ presentations, using their listening skills to learn about their new kindergarten friends. I am proud of how well they do with both of these challenging tasks. Tomorrow was supposed to be the first day of school. And let’s face it, teachers spend a lot of time thinking about that day. Not in June, when we are saying goodbye to the students that we have come to know so very well. But surprisingly, very soon after, when we finally have the time to reflect, deeply reflect, on our accomplishments and on our missed opportunities. Because there are always some. For me, it’s always the “did I do enough question” especially for my students who struggle. The students who were just shy of reaching grade level in reading or math. The one’s who struggled with friendships or anxiety and the ones who struggle with their identity even at age 7. Teachers face these issues each and every day and we hope that “in the moment” we say and do the right thing, We teach and reteach, problem solve and counsel. We do our best. And then we look to the future and wonder, how can I do it better next year. In Seattle, teachers went back to school a week ago. There were three days of professional development before the Labor Day Weekend. At my school, we talked about math, writing and reading, focusing on a new phonics curriculum. We welcomed new staff and had the rare opportunity to talk about curriculum with colleagues that teach in other grade levels. I work in a school with an amazing staff and for those 30 to 45 minute sessions, I was engaged and even inspired. But most of the time, I felt like our students must feel when everyone is expected to learn the same thing in the same way. So when those 3 days were over, it was what I didn’t hear that bothered me most. Even though our school just finished our first year, half year for some, as a 1to1 school, we didn’t talk about technology. We didn’t talk about giving kids the opportunity to drive their own learning. We didn’t talk about Wonder Wednesdays or Maker Spaces or Edcamps. I believe this was another missed opportunity. And so today, I returned to my classroom and spent the day getting ready for my 26 new first graders. As always I was imagining the possibilities. Alicia and I want to engage students on that very first day. We want students working in groups and creating tutorials that will showcase what they know. Last year students created digital books with titles like “How to Grow a Plant” or “How to Be a Good Listener”. These tutorials created a baseline for learning. Our students quickly latched on to the idea that we are all experts at something and that each and every one of us can be both teacher and learner. It set the tone for our year. We were going to try it again tomorrow and this time trust that we could act as facilitators as we watched our youngest learners work together to create new learning and share it with one another. But there will be no first day for us tomorrow. Seattle teachers are on strike. Tomorrow, Alicia and I will be on the picket line with thousands of our colleagues. All of us, dedicated educators, united by our passion that teachers and students deserve better. Would we rather be in our classrooms? Of course, but it’s time for us to take a stand, otherwise it would be just another missed opportunity for teachers to make a difference. I’d like to think that if you walked into my classroom on any given day, you would see students engaged in learning. My classroom is a place where students have lots of choices. I believe in the workshop model, a quick minilesson, and lots of opportunity for practice. I also believe in teamwork and collaboration. My students learn quickly that a huge part of first grade is learning how to work with others. After all, I tell them again and again that “none of us are as smart as all of us”. And when they start coming to me with stories of how “so and so” is sooooo hard to work with, I remind them that working with others is not always easy. And yet I believe that even our youngest students can learn to work with anyone, no matter how difficult the personality. 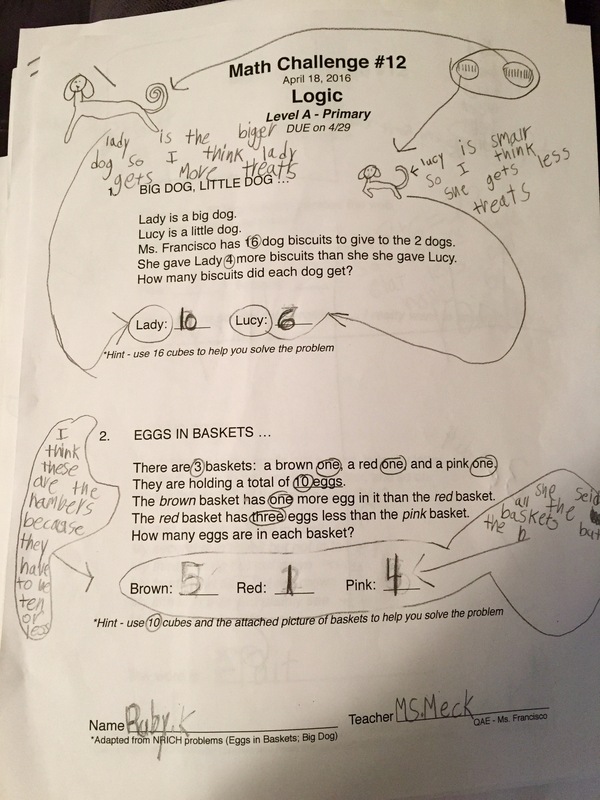 I will confess that getting first graders to collaborate is messy. And sometimes it’s just plain hard. And yet when I heard that teachers in classrooms around the world were actually setting aside time for students to plan their own learning I was intrigued. I started We Wonder Wednesday in my classroom two years ago. We Wonder Wednesday is similar to 20% time, or genius hour. The idea, simply put, is that students are given the time and opportunity to pick their own project, to wonder and learn about anything, to have complete voice and choice, even in a first grade classroom. In the beginning, I struggled. There is always so much that we have to make sure we are teaching day to day and I wasn’t quite ready to use that time and just hope that I would get results. So I dabbled in “we wonder” – I did it a few weeks on, a few weeks off, you get the idea. But even then I saw results. So last year, I decided I wasn’t going to waffle in wonder anymore. I would commit one 45 minute block of time every Wednesday morning to students and let them direct that time. And what do you know? It worked. Soon my first graders were researching pollution and interviewing our school custodian to find out how much garbage we were creating at school. That led to an interview with our school secretary who was worried that we were wasting paper in our building. 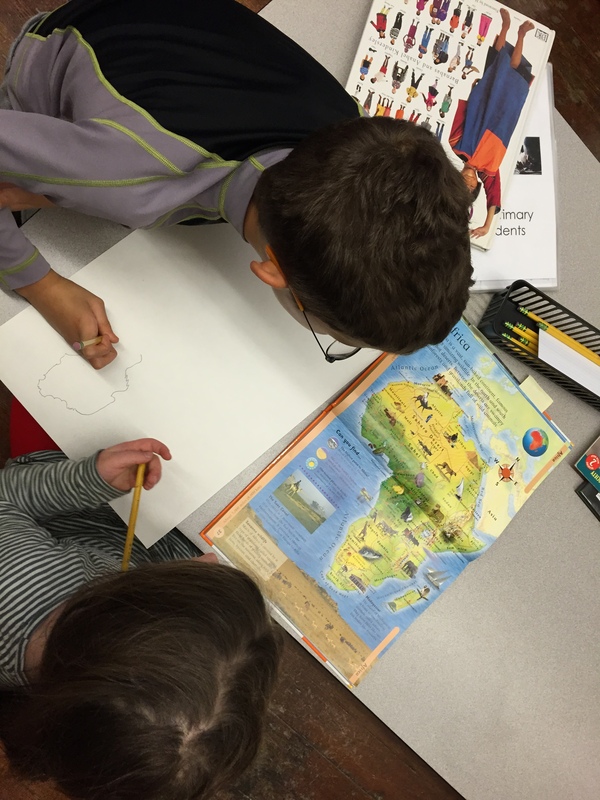 Another group was studying elephant conservation efforts in Africa and ended up creating maps that highlighted elephant habitat. I had two students who wanted to learn more about Ruby Bridges and so they read books together and watched video’s and then created their own book about her. These girls got the opportunity to show this book at a gathering of Seattle educators and parents who wanted to learn more about how students were using these devices in our classrooms. After their presentation, I asked them, what they were going to do next, and without hesitation they told the audience that they had learned so much they wanted to write a new book about other heroes in the civil rights movement. I will say that having a 1 to1 classroom made our “we wonder” time even more successful. These devices gave my class the opportunity to research, to do interviews, to make videos, and to keep all that research and work in one place. But not everyone wanted to use their iPad. I had many students who did their work on paper and poster boards. One group of students spent several months writing their own play. Their idea was to mash-up some of their favorite characters, Dr. Seuss, Koala Lu, The Grouchy Ladybug, and create a new story. The result a 3- act play that was produced, written, directed and performed by first graders. These are just a couple of examples of the learning that I didn’t plan or expect this year. Every Wednesday my students were choosing their own adventure in learning. And while they were learning they were also collaborating, sharing, and lifting each other up. And after awhile, this learning didn’t just happen on Wednesday. Most of my students worked on We Wonder during choice time or asked me if they could stay in at recess to continue working. I have always called my classroom a community of learners and this year it truly was. I learned that by lifting my expectations and giving students a chance to lead the way, we all learned more than expected.